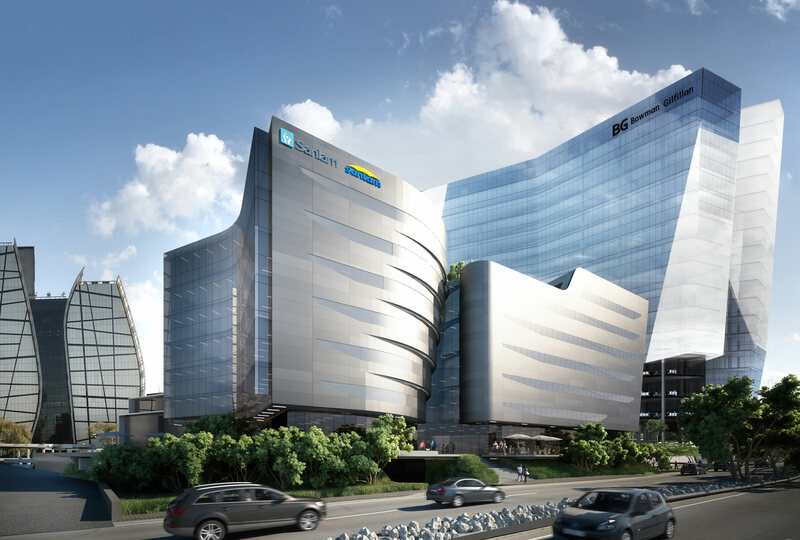 Alice Lane Phase II, a 16 000 m² building, is the head office of insurance giant Santam/Sanlam. The building is located on Alice Lane in Sandton, Johannesburg, and comprises six office levels and seven parking levels. The project achieved a 4-star Green Star SA Office v1 Design certification in December 2013, and a 4-star Green Star SA Office v1 As-Built certification in January 2016. Building is mechanically ventilated. Heating and cooling is provided by means of a four-pipe central chilled-water system, using air-cooled reversible heat-pump chillers and four-pipe in-ceiling fan coil units. Chillers placed on the roof make use of the compression cycle of refrigerants in order to transfer heat from the chilled water circuit to the atmosphere. The building has reduced energy consumption to 165 kWh/m² /year and carbon emissions to 198 kgCO2 /m² /year. The building has a groundwater harvesting system. The main electrical supply to the building is made up of two sections, a critical section, which is backed up by a generator, and a non-critical section. The non-critical section feeds items such as the main HVAC chillers, pumps, and items that do not require generator backup during a power failure. All other items are backed up via the generator, which provides the emergency backup required for the building. The fire-protection system has been designed to not expel any water during testing. Water is redirected back into storage tanks.